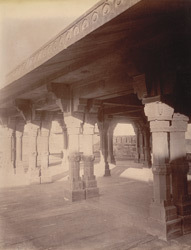 Photograph of the Panch Mahal at Fatehpur Sikri, from the Archaeological Survey of India Collections, taken by Edmund William Smith in 1893. The palace city of Fatehpur Sikri was built by the Mughal Emperor Akbar (r.1556-1605) from 1571 to 1585. The entire complex is built of locally quarried red sandstone, known as Sikri sandstone. The Panch Mahal (Tower of Winds) is a five storey building. There are eighty four columns on the ground floor. Each succeeding storey decreases in size with fifty-six columns on the first floor, twenty on the second, twelve on the third, and the top consists of a single chattri supported by four columns. Pierced stone screens once faced the façade, and probably divided the interior as well, suggesting it was built for the ladies of the court. This view shows details of columns on the ground floor.